The outgoing German finance minister, Wolfgang Schäuble, has recently expressed concerns about the risks posed to the world economy by high levels of debt. This column presents the latest Centre for Macroeconomics and CEPR survey of leading economists, in which a strong majority of respondents agree that an excess of public and private debt together with inflated asset prices mean that the world economy faces heightened risks. 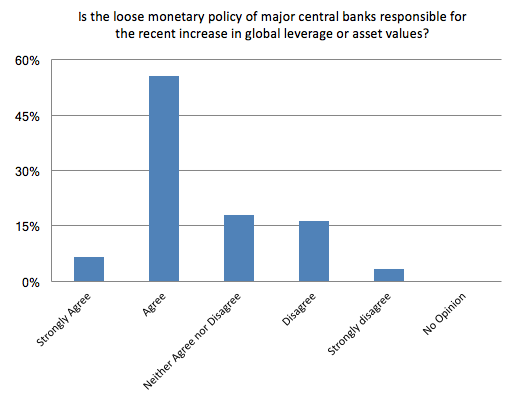 A similarly strong majority of the experts also agree that the loose monetary policy of major central banks is responsible for the recent increase in global leverage and asset values. A century of public debt and what have we learned? Wolfgang Schäuble, the outgoing German finance minister, warned in an FT interview this week that ‘economists all over the world are concerned about the increased risks arising from the accumulation of more and more liquidity and the growth of public and private debt’ (Financial Times 2017). 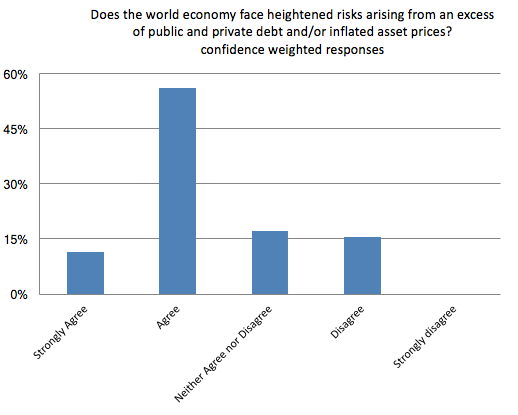 The first question of the latest CFM-CEPR expert survey asked panel members about the risks that debt poses to the world economy. Question 1: Does the world economy face heightened risks arising from an excess of public and private debt and/or inflated asset prices? Sixty panel members answered this question. A strong majority of 65% either agree or strongly agree, 15% neither agree nor disagree, 18% disagree, nobody strongly disagrees and 2% have no opinion. Leaving out the respondents who neither agree nor disagree or have no opinion, the majority increases to 78%. The outcome is similar when answers are weighted with self-reported confidence levels. 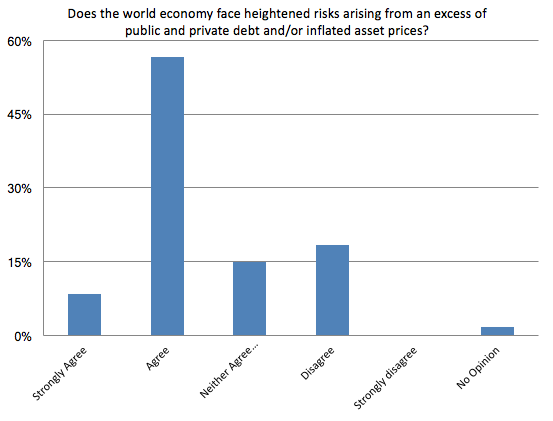 The second question of the survey inquired into the causes of elevated debt or asset prices. 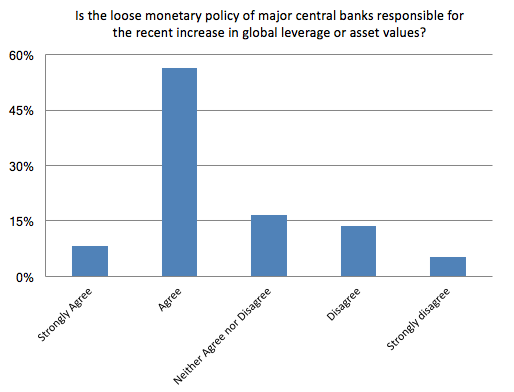 Question 2: Is the loose monetary policy of major central banks responsible for the recent increase in global leverage and/or asset values? Sixty-one panel members answered this question. A strong majority of 62% either agree or strongly agree, 18% neither agree nor disagree and 20% disagree or strongly disagree. Leaving out the group that neither agrees nor disagrees, the majority increases to 76%. The outcome is similar when answers are weighted with self-reported confidence levels. John Hassler (Institute for International Economic Studies, Stockholm University), who neither agrees nor disagrees, writes: ‘The major factor behind the rise in asset values and leverage is the long trend towards lower real interest rates. This trend has nothing to do with monetary policy. In the shorter run, however, central banks do affect real rates which recently has come on top of the trend.’ Other panel members echo this view. Borio, C (2017), Remarks at media briefing on 15 September, Bank for International Settlements, Basel. Financial Times (2017), “Wolfgang Schäuble warns of debt-driven global financial crisis”, 8 October. Professor of Economics and Fellow at St Hugh's College, University of Oxford. CEPR Research Fellow.